UPDATE 2/1: JOEY B’S DEAL ALERTS As Of 1/30! Another Way Collectors Help Collectors! If there is one thing I am either loved for or even hated because of, it is when I find deals! Why you may ask? Those that despise me is because I generally “cut into” their profits with the crazy sales and discounts I discover and then let everyone know about. On the other side of the coin, it is now a tradition over at Collector’s Trading Post on FaceBook that when a member finds an outstanding price or a hard to find item in the secondary market, they let everyone know! This is the absolute and true meaning of “Collectors Helping Collectors”! That being said, this will be the first post of many that I plan on writing whenever I am out and about looking for the best bang for the buck on the toys and collectibles we love. There is a smart way to collect and this new segment on CTP Universe will hopefully save you money and maybe even allow you to help another collector looking for that hard to find piece! “Knowledge is Power” is one of the best and to the point phrases out there, especially with the collecting hobby! TJ Maxx is commonly a secondary market store (close out buys is their bread and butter), yet you never know what you will find in here! 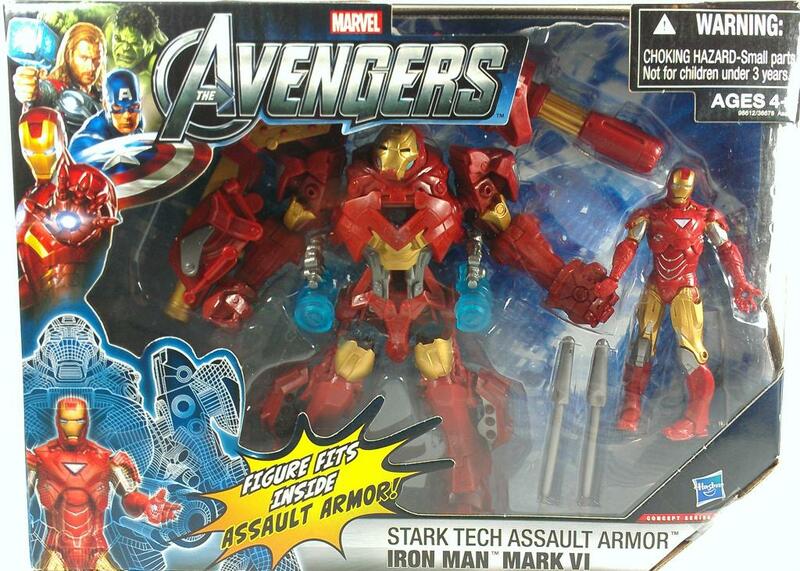 The Avengers Movie 3.75″ Stark Tech Assault Armor w/ Iron Man Mark VI – $12.99!! 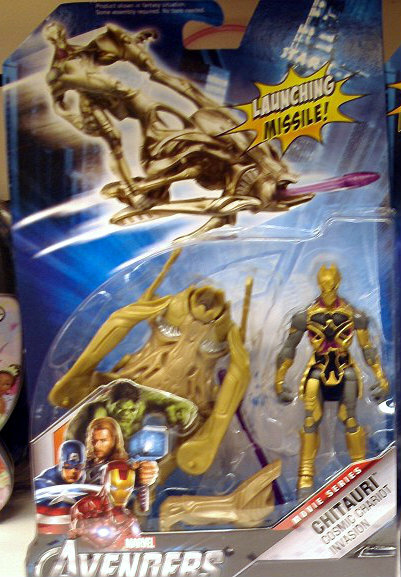 The Avengers Movie Chitauri Cosmic Chariot Invasion 3.75″ – $6.99!! Awesome Army Builder! 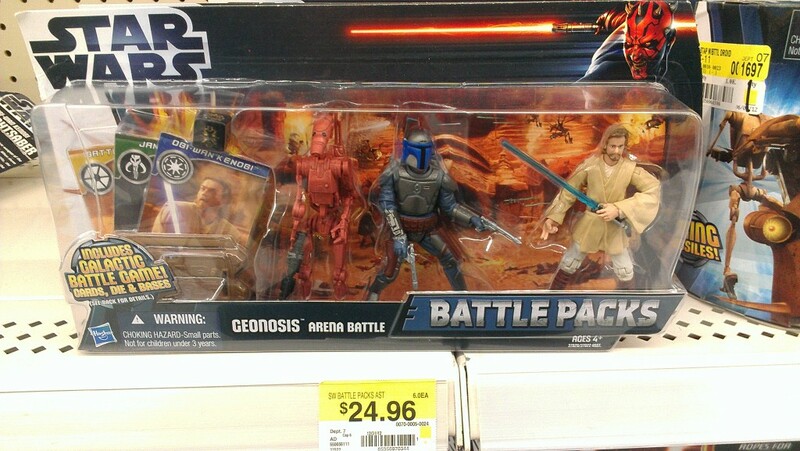 Star Wars Assorted 3-Pack Battle Packs – $12.99!! 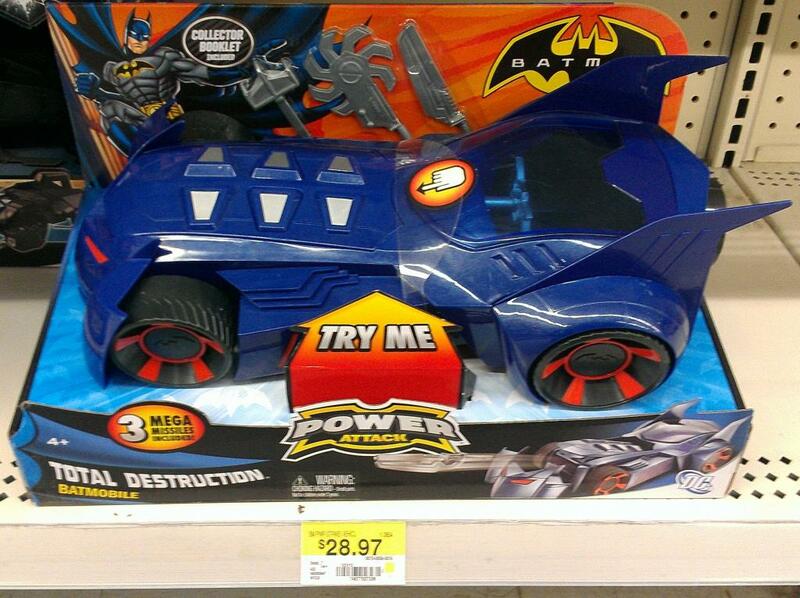 Walmart’s Price – $24.96! 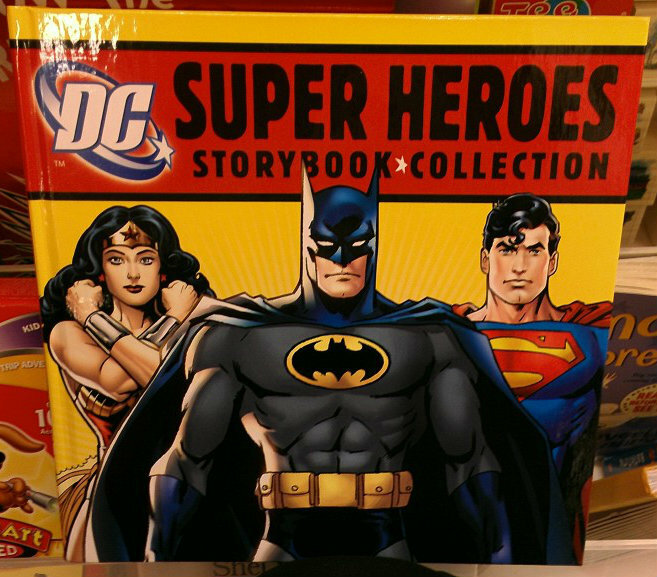 DC Super Heroes Storybook Collection – $7.99!! Great for the kids! Ross is very similar to TJ Maxx and Marshalls, except for one HUGE difference! Completely different close-out buyers! I have been literally speechless with some of the stuff they get in compared to everywhere else! Not to mention, they are usually about $2 less than the competition! 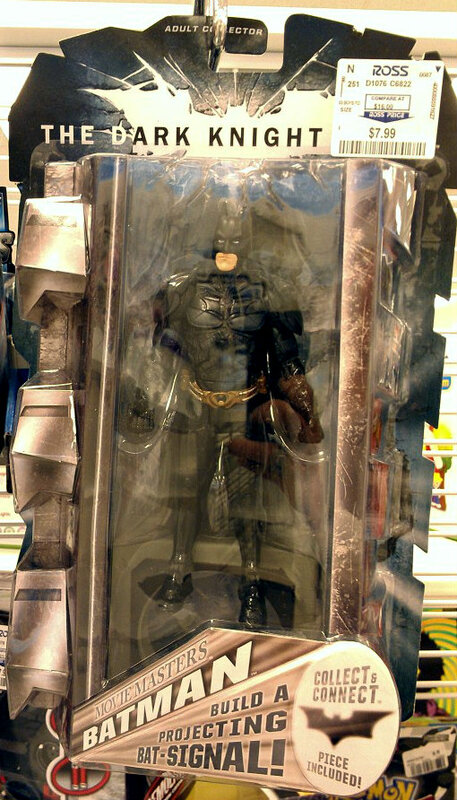 Movie Masters The Dark Knight Rises Figures w/ Batsignal CnC Piece – $7.99!! Star Wars Assorted 3-Pack Battle Packs – $10.99 (Perfect example! $2 less than TJ Maxx!) 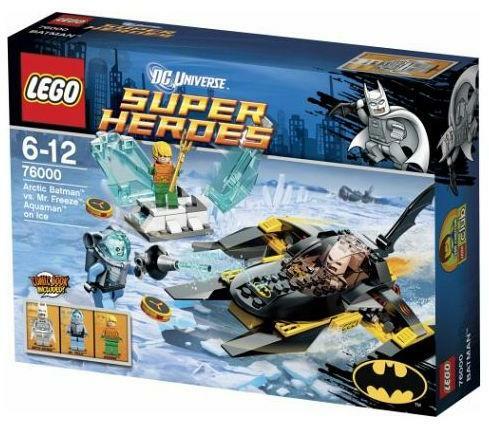 Walmart’s Price – $24.96! 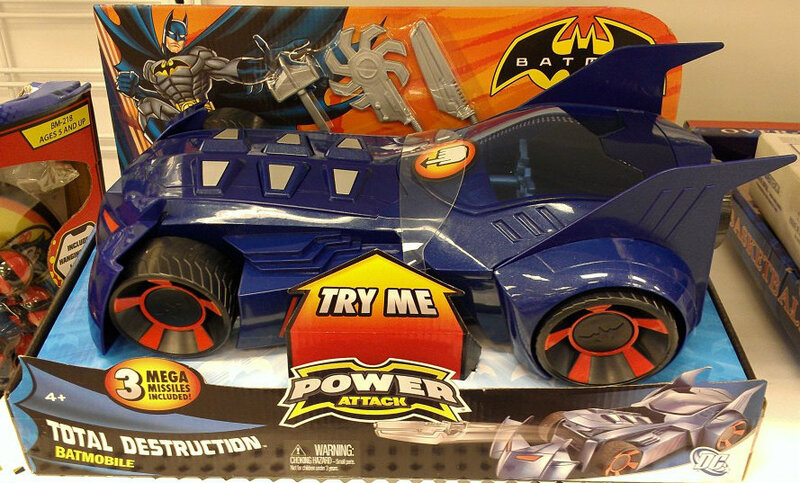 Power Attack Batman Total Destruction Batmobile – $13.99!! Walmart’s Price: $28.97!! Thundercats 3.75″ Deluxe Vehicles: Mumm-Ra Storm Charger & ThunderTank – ONLY $7.99 EACH! Now Marshalls will seem very similar to TJ Maxx. The reason is they are both owned by the same parent company and have the same close-out buyers! BUT, Do Not allow yourself to be lazy when you are out hunting! Sometimes each get different levels of difficult items than the other will! It is always a safe gamble to check both! CLEARANCE ALERT! 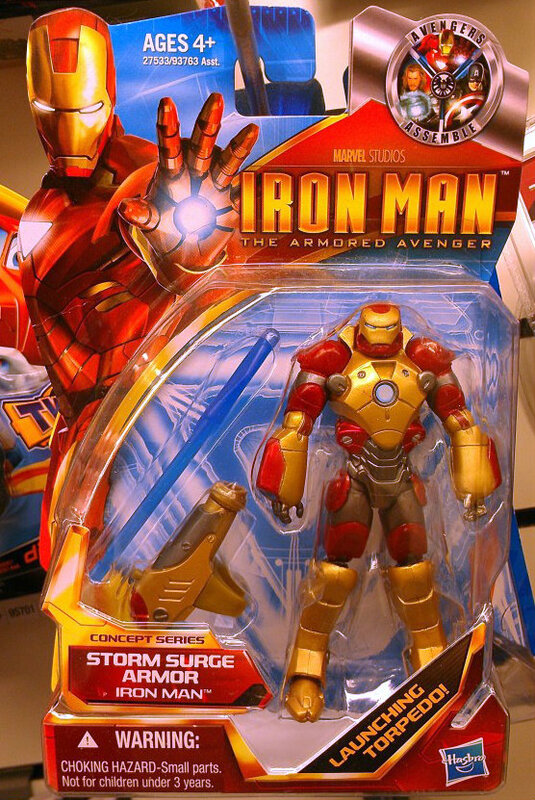 All 3.75″ Iron Man II and The Armored Avengers Figures are $4 – $4.50! 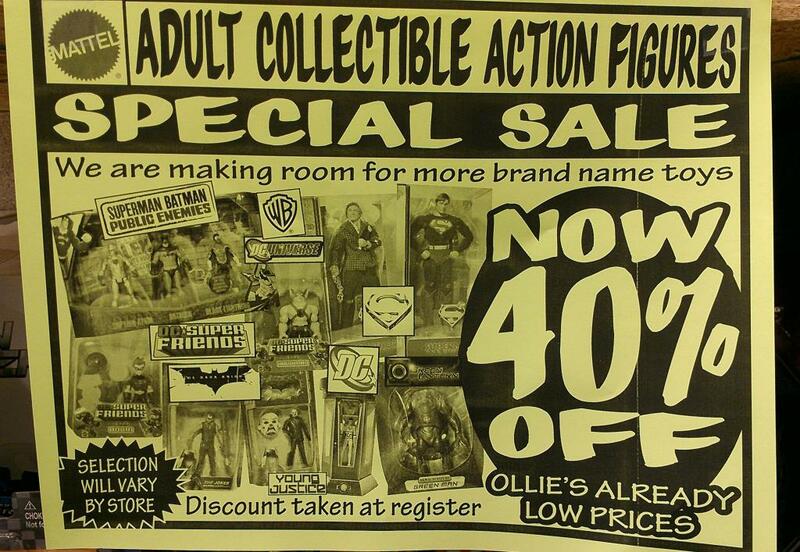 Also included but not shown are both Thor and Captain America 3.75″ Movie Figures. 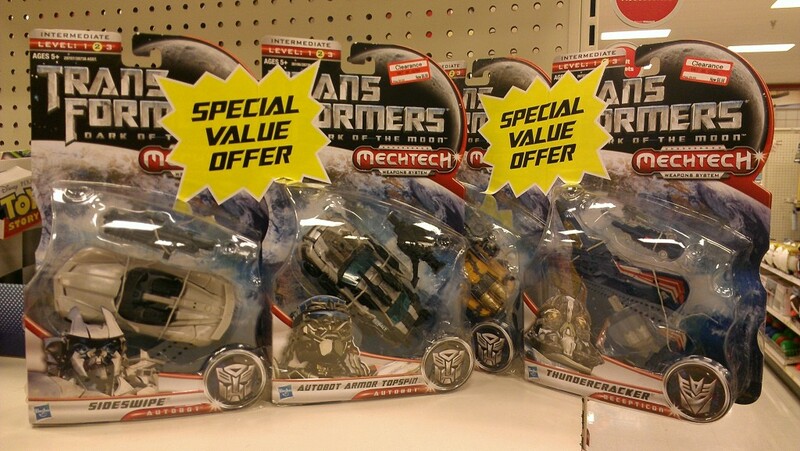 Transformers Prime Voyager Class Assorted Figures – $12.99!! 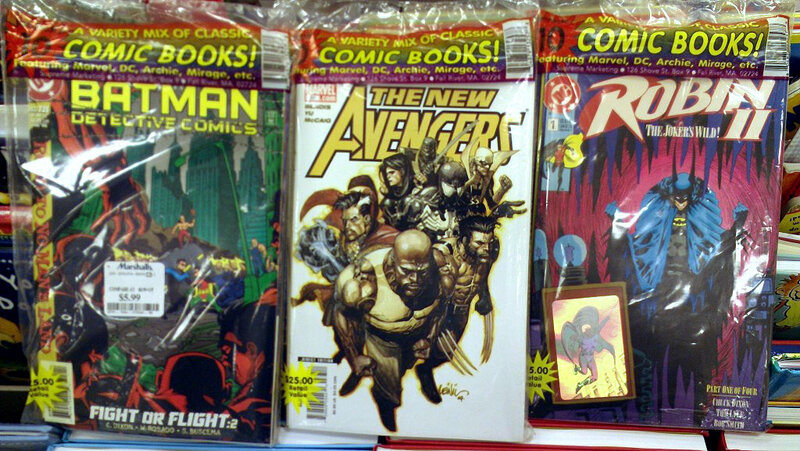 DC, Marvel, Dark Horse, Etc Comic Assorted 10-Packs – $5.99! 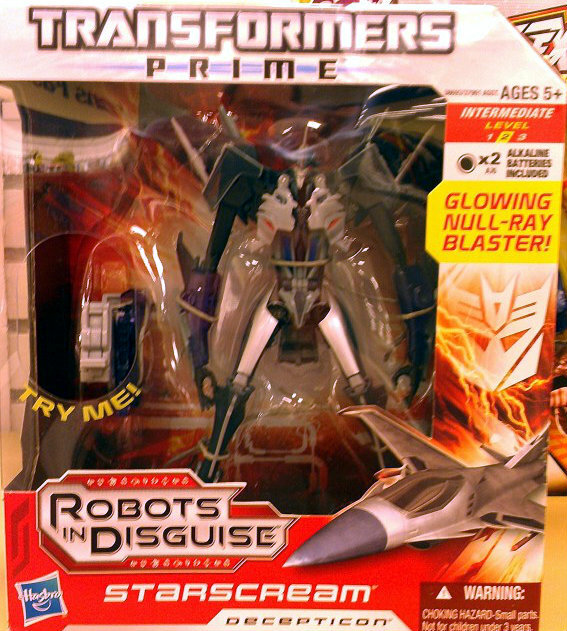 CLEARANCE ALERT! 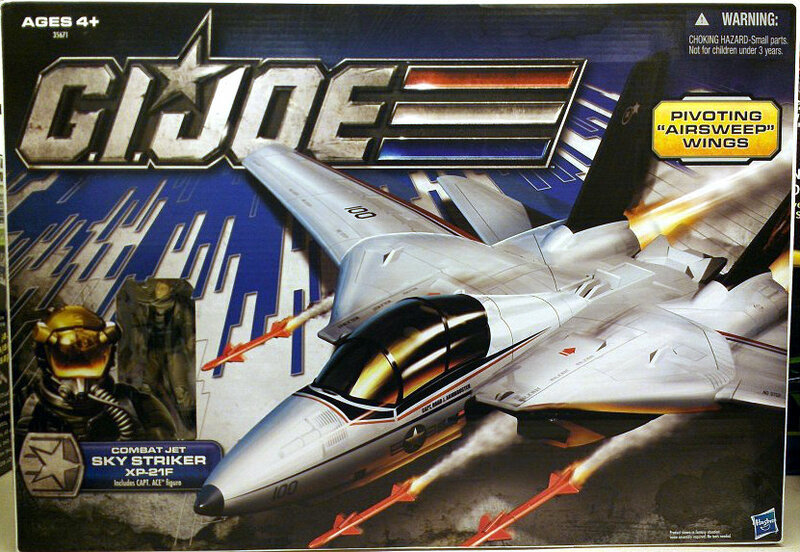 GI Joe Sky Striker Combat Jet REDUCED to $10-$15!!! CLEARANCE ALERT! Collector’s Edition Spider-Man Monopoly REDUCED to $10!! Can you guess the prices of everything in this store? OMFG! Never and I mean NEVER not go in this store thinking it is a waste of your hunt! I was short on time but I did find this newly filled and displayed …. 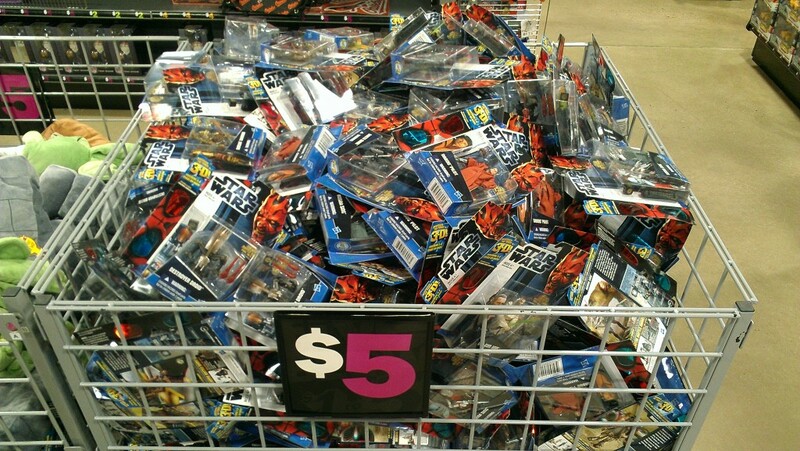 Star Wars Assorted Action Figures – $5!! Included but not shown are the Vintage Series. I am sure that elusive Armored Savage Opress is hiding in there somewhere! We all know Target, so no need to go into why you need to check this place out frequently! BUT, their 70% Off Clearance Sales are about to end and those items you kept procrastinating on to get will be donated to GoodWill and gone forever! CLEARANCE ALERT! 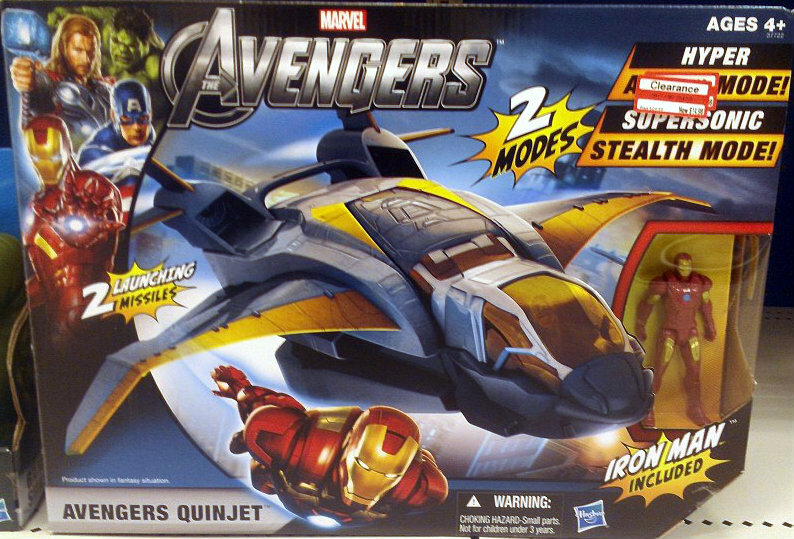 The Avengers Movie Quinjet with Iron Man REDUCED to $14.98!! UPDATE 2/1: SUPER CLEARANCE ALERT!!! 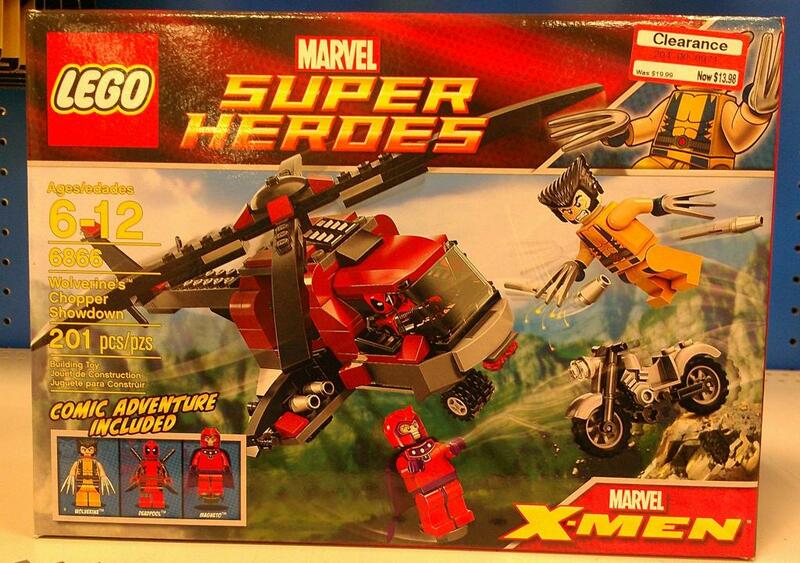 Lego Super Heroes Wolverine’s Chopper Showdown REDUCED to $13.98 —> RANG AT THE REGISTER FOR $5.98!!!!! UPDATE 2/1: CLEARANCE ALERT! 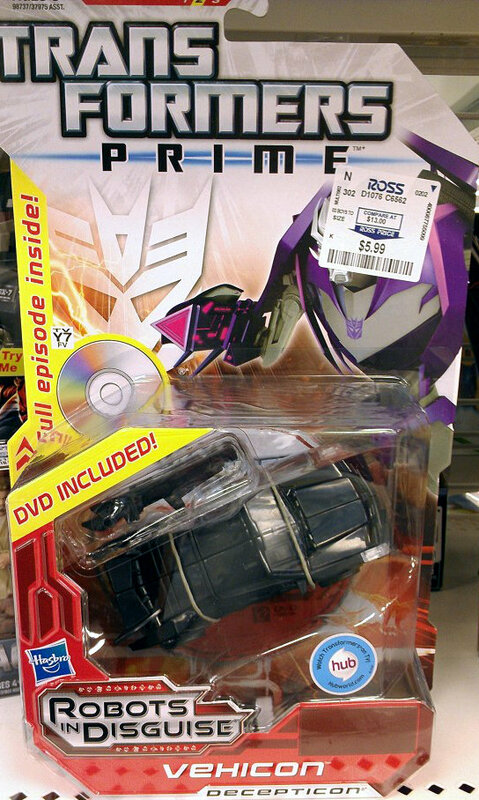 Transformers Dark Of The Moon Deluxe 2 Packs Reduced to ONLY $6.98!! 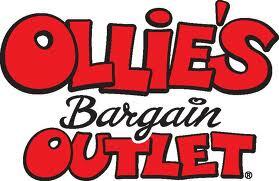 If you have never heard or been in an Ollie’s, you are soooooo missing out! They have serious buyers that seem to go after the good stuff like rabid pitbulls! You absolutely never know when they will receive something good in! The reason, they get deliveries EVERY DAY! Saweeeeeet! 40% OFF All Remaining MATTY COLLECTOR Buy-Out Items! Interestingly enough, mine still had alot! I truly hope you enjoyed and most importantly, benefited from this article! Keep the “Scalpers” at bay and always work hard to help each other out when you can! Until next time! 🙂 Thanks as always!! 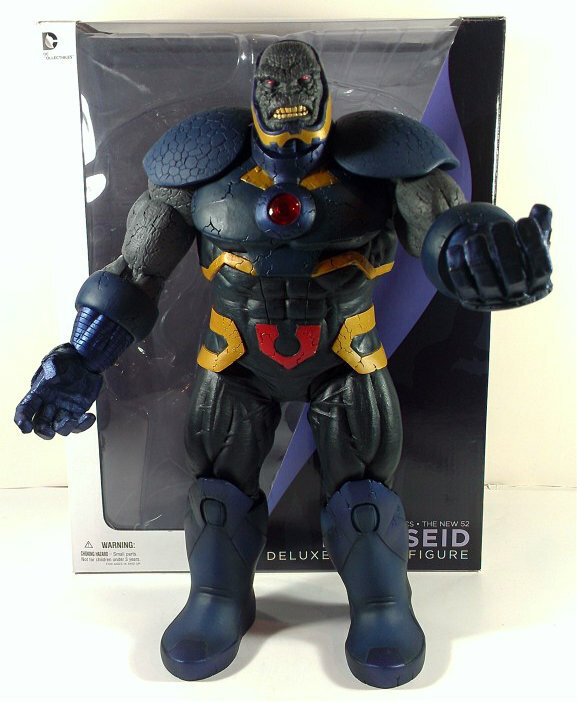 DC Collectibles New 52 Darkseid Deluxe Action Figure: Finding Room To Display This Beast! 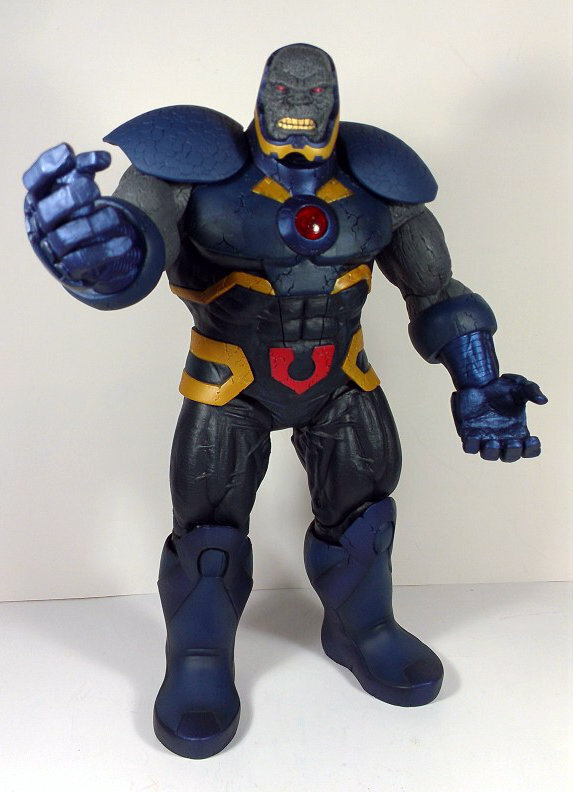 There has been a lot of opinionated reviews on DC Collectibles first Deluxe action figure from The Justice League line and for the most part they all agree that this thing is A.W.E.S.O.M.E.!! With that being said, I will attempt to come at this review from a different angle than the norm. How you may ask? Simple! By the same way all us “Open Collectors” do it and that is imagining how to display it and where! I do though, want to get some basic and crucial “Opener” facts out there in the form of specs. Okay, so now that we have the specs, let’s get into looking at this amazing figure! As the pic from The Justice League comic above shows, DC Collectibles has absolutely went all out with the whole entire New 52 Justice League Collector’s Line by keeping these figures “comic accurate”. Quality wise, there have been no issues what so ever with posing these for display. 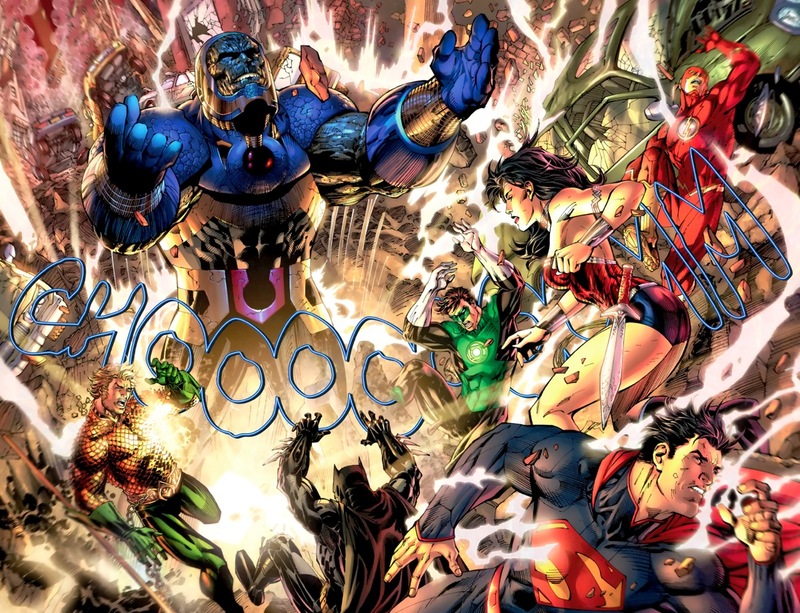 But this is where Darkseid comes into play! This thing is massive, solid and heavy! To speak “Collector Display Lingo”, there is not too much you can really do to create a true action scene outside of arm and head adjustments. The torso is solid, so the “arms spread wide and back arched roar” pose is out of the question. Who cares is my thought! 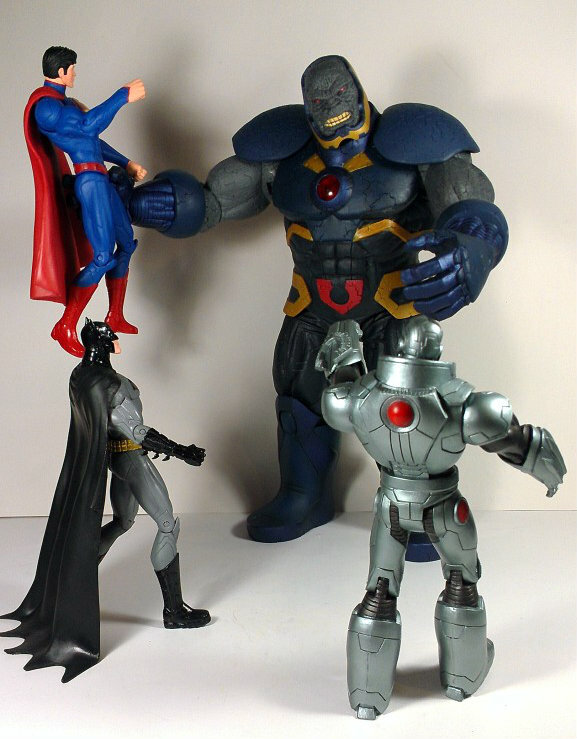 Darkseid usually stands there with his menacing scowl and watches as his Parademon army and henchmen wreak havoc on whatever world they are invading! The pic below is menacing enough to pull eyes from visitors whenever they are in your home! 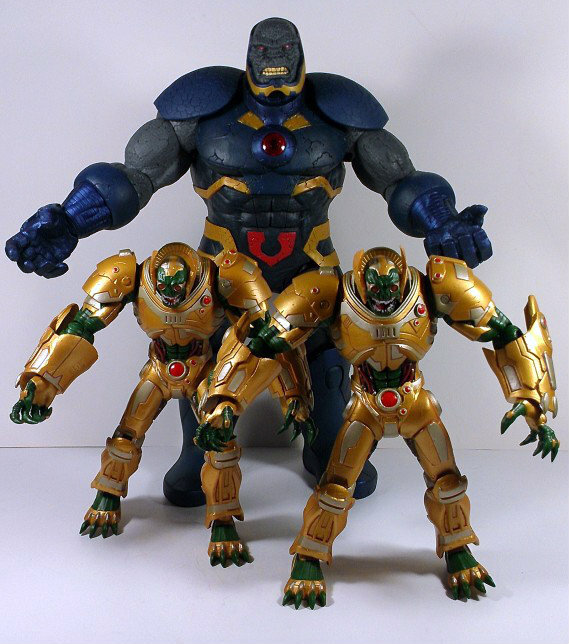 They look absolutey amazing posed as if they are waiting for Darkseid’s next command! 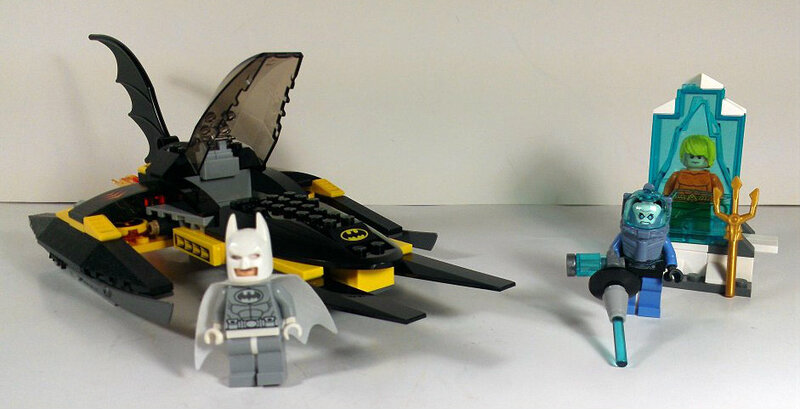 Yep, I bit the bullet and bought 2 Parademons for the display I am building currently. What? You can’t only have just 1 of those! It wouldn’t look right! 😉 Okay, so maybe some of you were not interested in multiples or even thought about his minions. 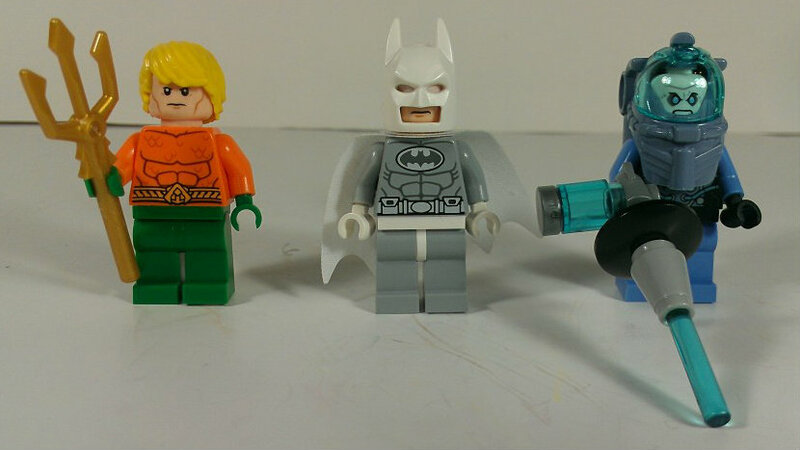 Yet, I guarantee that you had to imagine some sort of action scene you could create with the JL heroes! 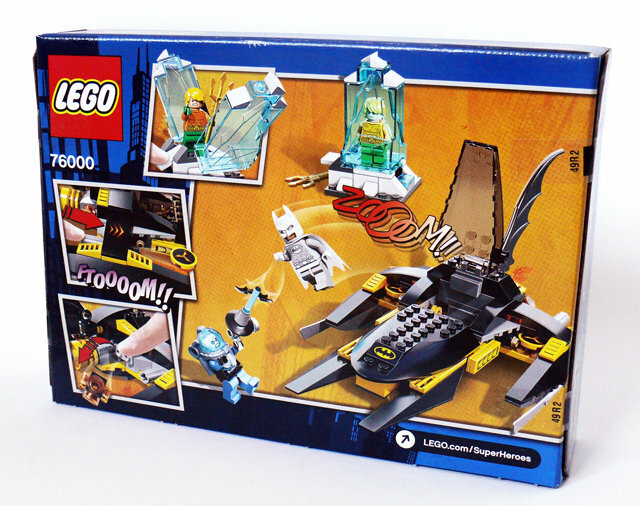 Throw Superman in the right hand, add a little Batman for body and a dash of Cyborg for zing and PRESTO! 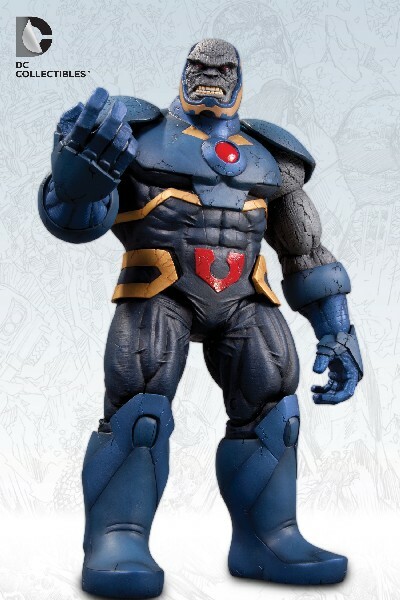 “Darkseid A La Mode!” So the answer is YES! 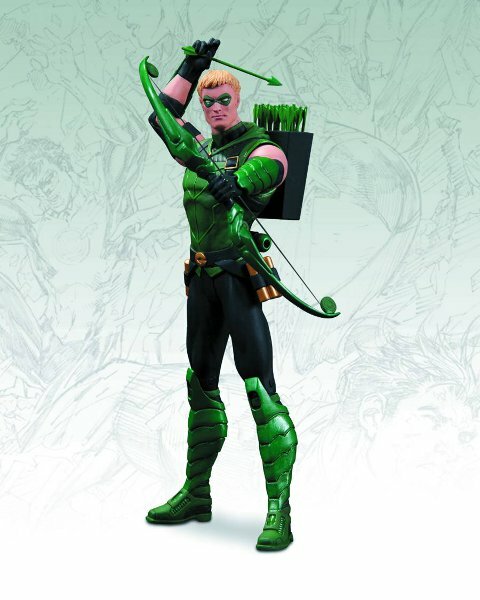 There are ways to truly give this DC Comics New God a front and center spot on a shelf, display cabinet or even your desk with the visual appeal to strike up a conversation at anytime! Or, if you are like me, I actually like to sometimes sit back with him displayed in front of me as I crack open the latest DC Comics New 52 releases, allowing my mind to fully engulf not only the comic but give the pictures and words a 3-D effect with Darkseid and the rest of the Justice League figures staring at me posed and ready for battle. Do not forget about these upcoming DC Collectibles Justice League releases for your displays and dioramas! 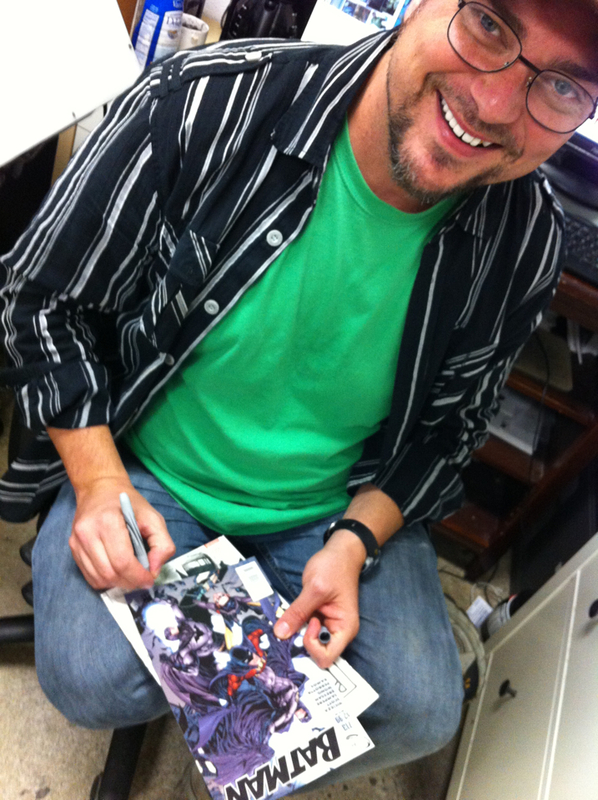 An AWESOME & Personal Experience With Comic Illustrator Steve Scott! For those out there who know me, they can confirm that 2012 was my breaking point with Mattel and their continuous quality control issues, not to mention their inability to finish any toy line they start! So from that point on I committed to downsizing my collections considerably and concentrate on a couple DC Collectible lines, Marvel Selects from movies and ART from local and professional comic illustrators! I was somehow intrigued with the idea of having something either unique or even created just for myself as a new way to express my collecting interest. 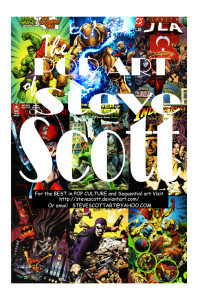 Enter: Comic Illustrator Steve Scott! I met Steve through my buddy Jason Q on Facebook. Of course, as a comic fan, when you actually meet the artist known for his work on the infamous Batman #713 (The issue that led into the DC52 revamp), it is quite a cool and exciting feeling. Besides that famous cover, he is also known for his work on X-Men Forever, Batman Confidential, Hulk, She-Hulk, The Avengers, Fantastic Four and JLA. Check this pic out and below you will see why it is so special! 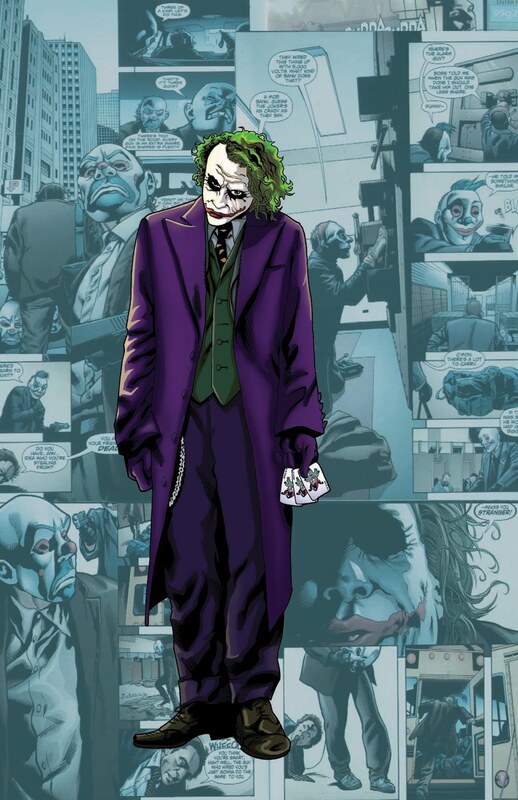 Steve has the distinct honor of being the only artist to do comic tie-ins for the “Batman: The Dark Knight ” movie. A very cool fact is that he is one of the select artists whose work hangs in the personal gallery of director George Lucas! So as you can see, this guy is very respected in the comic and art world. The cover you see is a one of a kind and in my personal collection. 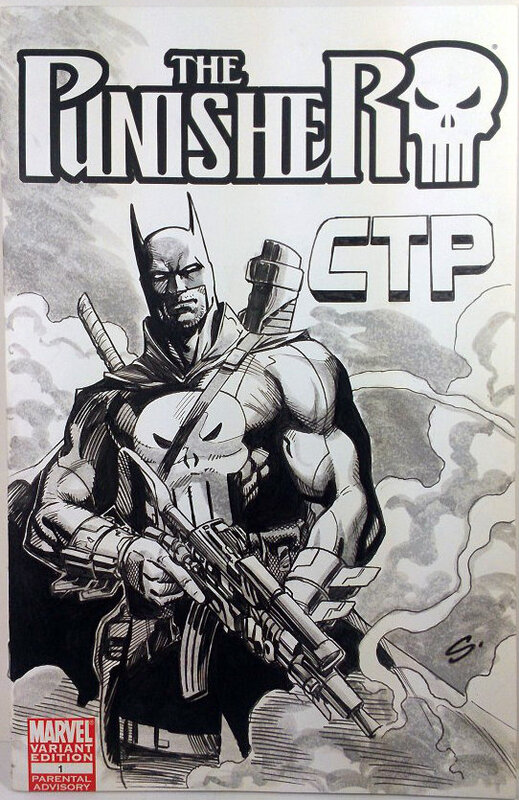 It was a comic dream of mine to hopefully see one day a Marvel and DC Crossover like the old days where Batman and The Punisher somehow became one in the same. Well after Jason informed Mr Scott of my request, he finally was able to get on it and completed during the Free Comic Day last year at 3 Alarm Comics in Mississippi. The CTP you see on the cover represents Collector’s Trading Post on FaceBook. A group I had created awhile back, with the sole purpose of having a place where collectors can help collectors without the gouged and obnoxious pricing of other groups or even Ebay. I have since turned CTP over to two of my very good friends, Bill and Rick. To this day, they still carry on the tradition and I still assist in articles and news as time permits. There is a very funny twist to the above cover though! Once Steve completed it, Jason had called me since he works part-time at the comic shop, with the news that someone had already offered $60 for it and they decided to put it up for auction (mistakenly of course)! LOL, I was like, “Oh Hells No!” So I immediately dropped $100 to deter anyone else from claiming what I had already considered mine! One thing you should know is that Steve is one of the most giving and friendliest people I have had the pleasure to speak and/or deal with. 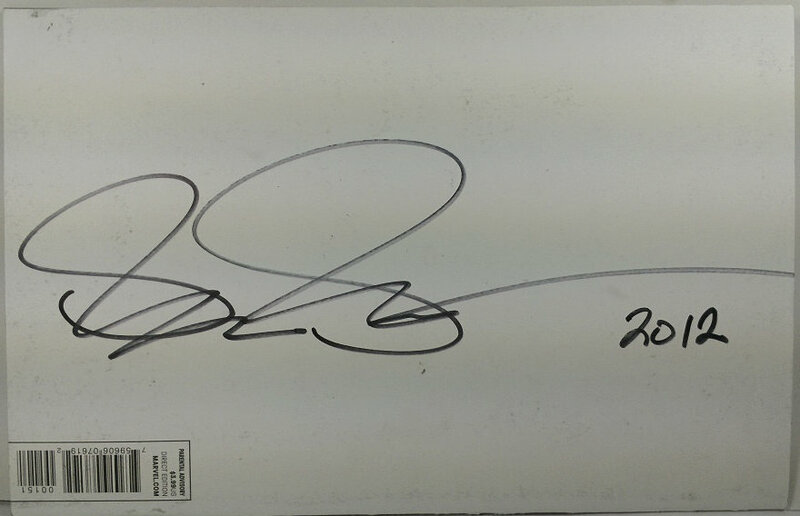 All proceeds from all of his auctions go to local charities and not in his pocket! That is something that speaks miles for a person! But my story does not end there! 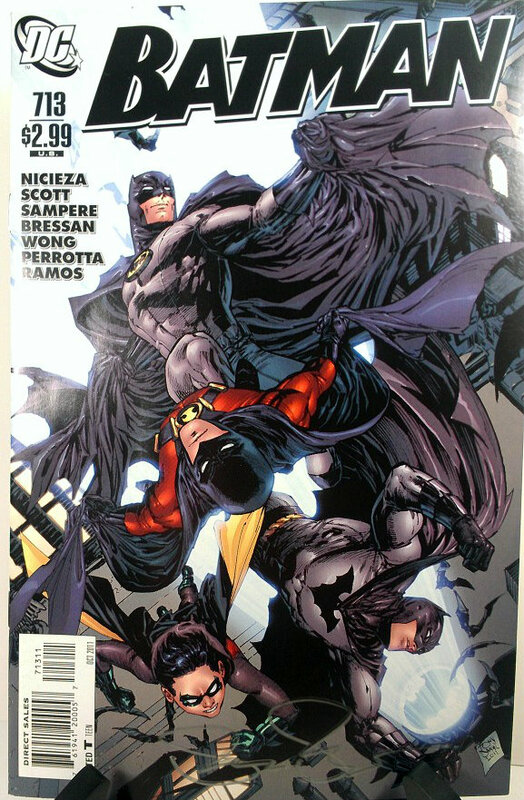 Since there was a major communication error, I asked if he wouldn’t mind hooking a brother up and signing my copy of one of his most famous comic illustrations to date: BATMAN #713! He informed me that it would be his pleasure and here is that very same issue that is displayed in my “Man-Cave”! 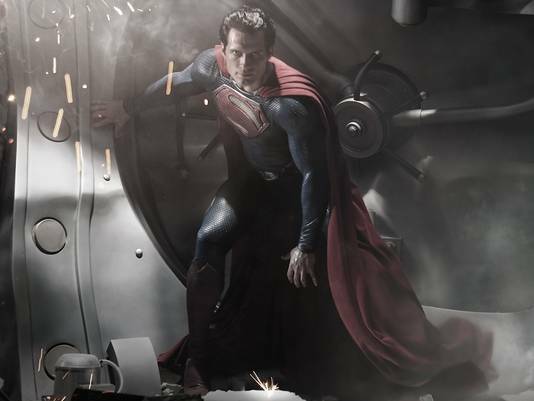 Superman: Man Of Steel Will Decide The Fate Of The Justice League Movie! June 14th cannot seem to get here fast enough for many people, including myself, as it pertains to Warner Brothers and Zack Snyder’s revamp of the Superman franchise. So much is riding on this project with how DC Comics will be brought to life on the Big Screen! 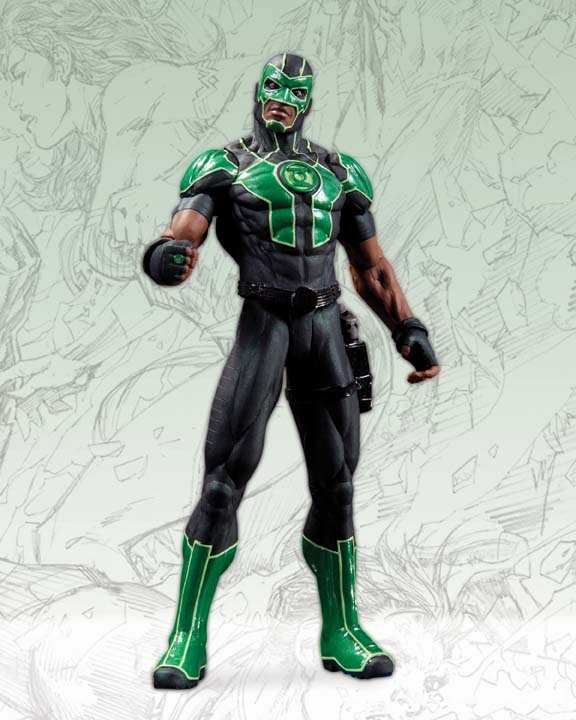 The most recent attempt to generate a fan base resulted in an Epic Fail known to many as Green Lantern! For a movie that cost $200 million to make, the $220 million it actually brought in was a severe blow to the movie studio. This is why Superman: Man of Steel must succeed above all expectations to pave the road for future movie projects like The Justice League, The Flash, Wonder Woman, Batman and so on. 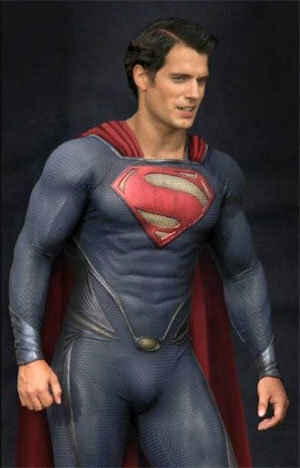 But, I have hope and that hope rides in Henry Cavill! Take a good look at the above picture! This guy, for the first time in the history of Superman media, has fully embraced the role! We finally have an actor with not only the physical build but the height and determination to portray The Big Blue Boy Scout! Cavill went into this head first and crushed a workout routine that was complimented by a 5000 calorie diet per day to put the muscle mass on to give true life to this iconic character. No one else has ever shown this type of determination before now! For that, it has awoken that inner child of mine and has me on edge in anticipation! “It’s hard to put a finger on it, but sometimes it just feels right. Curt Swan and Alex Ross have captured Superman better than any other artist. Cary Bates, Elliot Maggin, Mark Waid, Gerry Conway and Alan Moore have nailed it more than any other writer. There have been some brilliant creators on Superman over the years telling wonderful stories, but my radar is attuned and I can spot an impersonation. Jose Luis Garcia Lopez draws a guy I believe is Superman just like Alex Ross can. But others can’t regardless of how brilliant they may be. It’s just an X-factor or an understanding of the character. Anyway, it’s the same with casting. So many people been pored over all the years and so many of them close, but wrong. Brandon Routh is actually brilliant and you only have to see Scott Pilgrim to see how impeccable his timing is. But he looked more like Christopher Reeve than Superman. Dean Cain, Tom Welling and all the others were completely wrong for the part and the big names mooted were never right either. 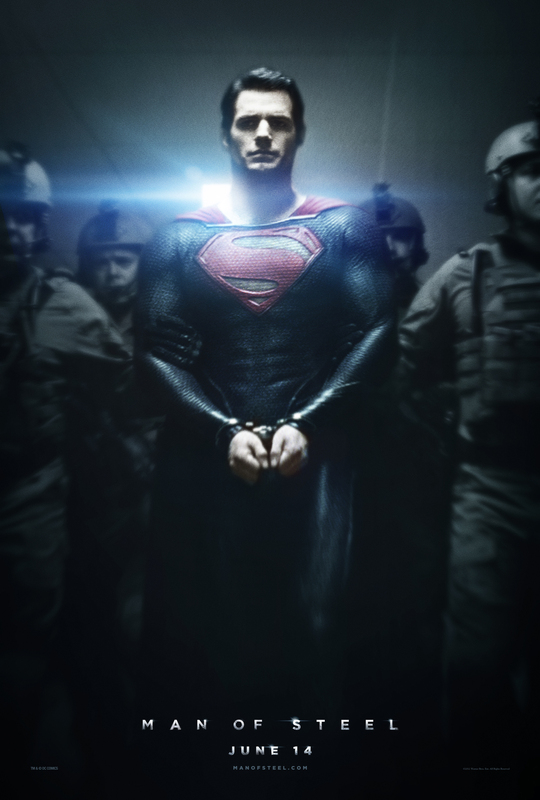 But I completely buy Cavill in this role. That instinctive gut feeling that I’m looking at a pic of Superman. BOOM! That right there is gold my friends! This is only one of a plethora of comments that have been tossed out there for us to drool over! Everything about this movie so far has been given nothing but extremely positive praise! Oops, my bad! I forgot about the morons over at yahoo.com! 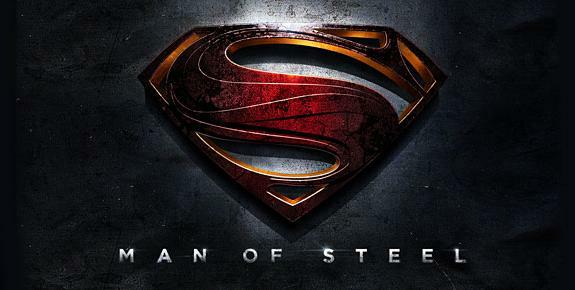 They deemed Superman: Man Of Steel one of the “Biggest Movie Disappointments of 2012” based off of a 3000+ vote because his new suit did not include the “Red Underoos”! Needless to say, I have stopped visiting that site since they show the intelligence of a single cell organism from the primordial soup of life! Yes, I am harsh, but I do loathe ignorance. Opinions, good or bad, are fine. That poll though was down right stupid! Here is the YouTube link for the #2 Trailer if you have yet to see it! AMAZING! You can also join the discussion in progress on our forums here.